Delicious quick and easy meals with a Hemsley twist. Bestselling home cook and co-author of The Art of Eating Well and Good + Simple, Melissa Hemsley of Hemsley + Hemsley, presents flavourful and veg-packed dishes. Featuring supermarket ingredients, simple methods, and tips and tricks to make no-fuss great food, Eat Happy is designed to see you through the whole week - tempting breakfasts to family dinners and lunches, as well as party food, snacks, baking, desserts, drinks, and simple, healthier versions of takeaway favourites. Comfort and indulgence are at the heart of Melissa healthy food, with plenty of ideas for everyday meals, batch cooking, cutting down on kitchen waste, and dishes that can be enjoyed for supper and leftovers for a packed lunch. 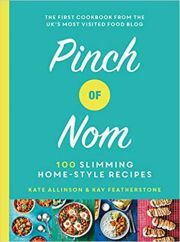 Amongst the 120 brand-new recipes are, Breaded Chicken Katsu Curry, Sesame Salmon with Miso Veg Traybake, Roast Carrots with Pomegranate Molasses and Pistachios, Coconut Chocolate Clusters and Ginger Fruit Loaf. These are delicious alternatives and satisfying treats that encourage even the most time-poor cook to take pleasure in healthy fast food that puts taste first.